It is remarkable that little historical evidence has remained about the saint who is venerated as Apostle to the Irish, while legends surrounding him abound. The only documentary sources regarding his life that are recognised as authentic are his Confession and an Epistle to a Northumbrian chieftain called Coroticus. According to these sources Patrick was born in western Britain, probably in Cumbria, as the son of a Roman official who was a Christian. At the age of 16 he was captured by pirates and sold as a slave into Ireland, where he worked as cattle-herd for his master in County Antrim for six years. There he lived among Christians, which further shows that Christianity was introduced into Ireland before Patrick. He eventually escaped and landed in an uninhabited land, possibly Brittany. Years later he returned to Britain, but he was called in a vision to return to the country of his enslavement for the sake of the Gospel. According to legendary sources, while Patrick was in Gaul he visited the island monastery at Lérins, a famous centre of Orthodoxy in the West. Before returning to Ireland he was ordained at Auxerre, either by St Germanus or his predecessor St Amator. Patrick landed in Ireland in 432 at Saball near Wicklow and founded a church above Strangford Lough, where on Easter Saturday of 433 he lit a Paschal fire. After seven years of missionary travels over Ireland he spent the whole of Lent on a mountain in County Mayo, now known as Croagh Patrick. According to Roman Catholic tradition Patrick became the first bishop of Armagh, which by the eighth century had become the ecclesiastical capital of Ireland. He reposed at Saball in 461 and was buried in Downpatrick, according to legend. 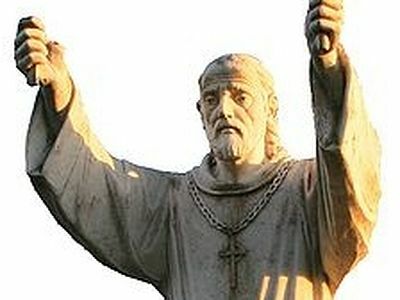 His feast day is 17 March, and the earliest mention of its celebration dates from 670. 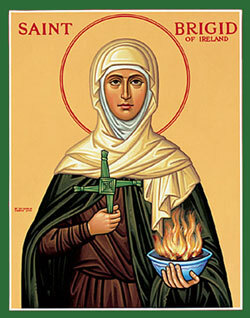 The best-loved Irish female saint, St Bridget, lived in the late 5th and early 6th centuries. Her veneration would become so popular that it rivalled that of St Patrick, until the eighth century when Armagh achieved pre-eminence among the Churches in Ireland. She founded her monastery in an oak grove at Kildare (‘church of the oak grove’ in Gaelic), where a sacred fire would be kept perpetually alight for nearly a thousand years after her death. It was a mixed monastery for men and women, headed by an abbot and abbess respectively. Such was the saint’s stature that the diocese of Kildare during her lifetime was known as ‘a see at once episcopal and virginal’. Bridget passed into eternity around the year 525. Her feast is celebrated on 1 February, one day before the Feast of the Presentation of the Lord. Another pioneer of Irish monasticism was St Enda, who was educated at Whithorn in Scotland. On his return to Ireland he established monasteries in the Boyne Valley, and around 484 he moved to the far west in order to found a monastery on Inishmore in the Aran Islands. Here he received later saints such as Cieran and Brendan for instruction and advice. Enda reposed on Inishmore in 530. Feast day: 21 March. One of the earliest Irish missionaries to the Continent was St Fridolin (Fridolt). At first he was a bishop, who around 500 went via Scotland to Aquitania in Gaul. There Fridolin founded a monastery at Poitiers and converted the bishop and people from Arianism to belief in the Trinity. From Poitiers he went under royal protection to the Vosges and founded the monastery of St Avold. Further monasteries were founded by Fridolin at Chur in Rhaetia and Säckingen in Germany. Everywhere he converted the heathens to the Christian Faith. He is venerated as the Enlightener of the Upper Rhine, his feast day being 6 March. A Leinsterman, St Finian was destined to become one of the great developers of Irish monasticism. He was born late in the 5th century and went to live in monasticism in Wales. Upon his return to Ireland he founded two monasteries, and then around 520 the famous one in Clonard. At Clonard over the following centuries thousands of monks would read the Scriptures, the Church Fathers and live monasticism before setting out on their missionary journeys. Finian also drew up the first Irish penitentiary, thereby influencing St Columban in his better-known one. He reposed during an attack of the yellow plague in Ireland in 549. Feast day: 12 December. 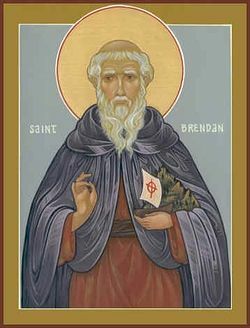 Around 489 a man was born near Tralee on the south-western coast of Ireland, who would become famous as St Brendan the Voyager. He established a number of monasteries, of which the one at Clonfert (founded in 559) became the most well known. After receiving advice from St Ita of Limerick and St Enda of Inishmore, he set sail in the Atlantic with a number of companions. For seven years they sailed the ocean to the west of their homeland, revisiting the same islands each year for the main festivals of the Church. There is a possibility that Brendan and his companions ventured as far as the North and Central American coast. He reposed around 575. Feast day: 16 May. 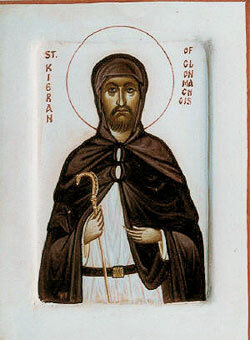 St Ciaran (Kieran) was born in the western province of Connaught and educated like so many other monks at Clonard. He then went to live at St Enda’s monastery at Inishmore, where he stayed for seven years and was ordained a priest. From the Aran Islands he went to Lough Ree, where he founded his own monastery on an island. After a further seven years Ciaran founded his most famous monastery at Clonmacnoise on the west bank of the River Shannon, in 548. In the following year, at the age of only 33, Ciaran succumbed to the plague that also claimed the life of St Finian. By the 8th century Clonmacnoise had become perhaps the largest monastery in Ireland, possessing a school, writing room, and numerous churches. It was also famed for its large number of high crosses, most of which were destroyed by the Vikings. As if this was not enough, the Clonmacnoise Cathedral was looted and desecrated by Protestants in 1552. St Ciaran’s feast day is on 9 September. 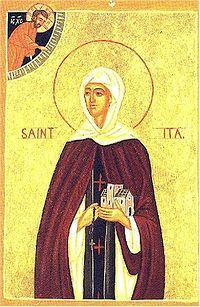 Together with St Brigid the most popular woman saint of Ireland is St Ita, who lived some 50 years later. She established her convent near Limerick, where many of the Irish saints would come to be taught by her. This included St Brendan the Voyager, who was told by Ita that God loved three things: a pure heart, a simple life, and generous charity. She reposed around 570. In Alcuin’s poem on the saints of Ireland, Ita is described as ‘the foster mother of all the saints of Ireland.’ Feast day: 15 January. 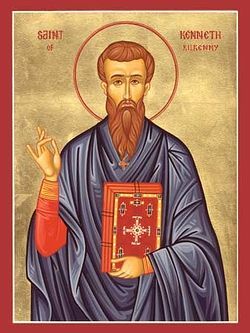 St Kenneth (Canice) was born around 516 in Ulster, and was educated first at Clonard and later in Wales. In 562 he went to Scotland and founded a monastery on the island now known as Inch Kenneth, to the north of Iona. From there he undertook missionary journeys to the Picts in Scotland, including the Outer Hebrides. Later Kenneth also founded a monastery at Aghaboe (now Kilkenny, which means ‘church of Kenneth’ in Gaelic) in Ireland, where he gained renown as a scribe. His work includes commentaries on the Four Gospels, known as the Chain of Canice. He was a close friend of St Columcille, and several incidents of what we now call 'telepathic' communication between them have been recorded. He reposed around 600. Feast day: 11 October. After studying under Fintan of Cluain-Edrech, St Comgall became a hermit on the shores of Lough Erne in the west of Ireland. This period of asceticism and contemplation prepared him for his major task of founding the monastery at Bangor, on the coast to the east of Belfast, in 559. There he instituted a harsh regime that would nonetheless over the next centuries be followed by around 30,000 monks. Bangor would become one of Ireland’s most prestigious monasteries, from where St Columban and St Gall set out on their great missionary journey to the Continent, and from where St Moluag went to Scotland to found the monastery on Lismore Island. According to tradition Comgall visited St Columcille on Iona, and accompanied him on his journey to the Pictish king. Comgall reposed as abbot of Bangor around the year 599. Feast day: 11 May. One of the greatest Irish saints, St Columcille (which means ‘Dove of the Church’), was born of royal descent around 521 in Donegal, in the town now known as Glencolumcille (‘valley of Columcille’ in Gaelic). He later adopted the name of Columba. He lived first at Moville and then with the Leinster bard Gemman. Then he went to St Finian at the monastery in Clonard, where he was ordained. At the age of 25 he founded his own monastery of Daire Calgach on the site of the present-day Derry. Such was his love for God’s creation that he changed the original plan of his monastery so that no trees would have to be felled to build it. At Derry he devoted himself to a life of prayer, fasting, charity and growing food. He also travelled widely, preaching, teaching, healing and founding numerous churches. According to Columcille’s biographer Adamnan, the saint simply decided to make a journey for Christ from Ireland into Britain. Thus it was that around the year 563 Columcille left Ireland with twelve disciples and settled on the Scottish island of Iona (Hebrew for ‘dove’), where he established his most famous monastery. Iona would be the spiritual centre of the Irish mission to Britain for generations to come. In fact, from the 6th until the 9th centuries Iona served as the pivotal point of the whole Irish Church. From Iona Columcille undertook missionary work among the Picts in Scotland, converting King Brude of the northern Picts and ordaining the Scottish king Aidan to the priesthood. As was the case in Ireland the Scottish Church was strongly monastic. The bishops were under the authority of Columcille, who was a priest and abbot. After his death the Scottish bishops still fell under the authority of the abbots of Iona. The monastic settlement on Iona was characterized by communal possession of property, as well as humility and compassion. The latter extended towards animals as well, in agreement with the Irish love for the Creation. 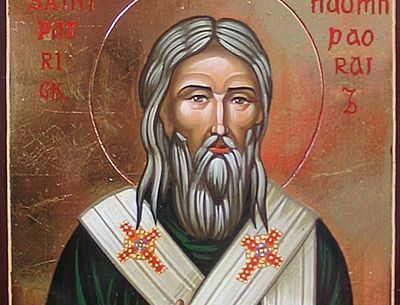 As was the case with thousands of Orthodox saints such as St Guthlac of Crowland, St Symeon the New Theologian or St Seraphim of Sarov, St Columcille was at times seen to be radiating a divine, immaterial light. While at prayer the saint was seen surrounded by a heavenly light, descending and filling the entire church building. At other times St Columcille was seen with angels hovering about him, or with a column of light rising from his head. In Orthodox Christian theology, phenomena like these are ascribed to the uncreated energies of God, in which the saints through their exceeding holiness are allowed to participate. St Columcille also played a key role in the establishment of an independent Scottish kingdom, granted at the Irish assembly at Drumceat around 575. Until that time the Scottish king was under Irish suzerainty, since the south of Scotland was colonized by Irish settlers who founded the kingdom of Dalraida around 490. Columcille was a prolific writer of Gospel books and hymns, and also wrote the Cathach, the earliest Irish manuscript of note. Such was the saint’s versatility that he prevented a plan to expel the bards from Ireland and defended their traditional organisation. On Iona he passed into eternity on 9 June 597, afterwards to be celebrated as his feast day. Also born in the north of Ireland, around 530, was St Moluag. He first went to the monastery at Bangor, and in 562 he crossed the sea and founded a monastery on the Scottish island of Lismore. From there he made missionary journeys to Skye and the Outer Hebrides, and to the Great Glen to the east. He founded Christian settlements at Fort Augustus and Glen Urquhart on the shores of Loch Ness, and Rosemarkie on the Black Isle. St Moluag reposed in 592. His crozier, made of blackthorn and originally covered in copper, is still preserved on Lismore Island. Feast day: 25 June. As a young man St Kevin passed through the Wicklow Hills accompanied by an angel and settled at the upper lake at Glendalough (‘valley of the lake’ in Gaelic). In this idyllic environment he founded a monastery that was to become one of the largest and most influential in Ireland for centuries to come. As was often found among Irish saints, Kevin lived in harmony with nature, so that the story is told of a blackbird nesting on his hands while outstretched in prayer. He reposed at an advanced age in 618. Feast day: 3 June. 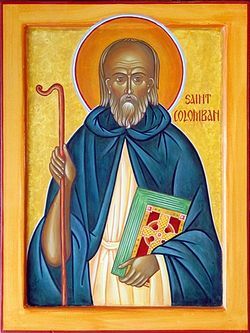 St Columban (also known as Columbanus) was born in Leinster in 543, and was destined to become the best-known of the Irish missionaries to the Continent. As a boy he received religious instruction from the wise Shinell at Cluainerad. He then went to the great monastery of Bangor in County Down, where he learned Latin, some Greek and possibly Hebrew. Around 587 he set out with twelve companions for Gaul, where they wandered about and settled in Burgundy, on the edge of the Vosges, around 591. He first founded a monastery on the site of a ruined temple of Diana, and then two more monasteries at Luxeuil and Fontaine. Luxeuil would become the most famous of these, and there the Irish date for Easter was retained. This aroused the opposition of the Gallic bishops, who followed the Roman date for Easter. Columban also aroused the enmity of Brunhild, the grandmother of King Theoderic II who had both her husband and Bishop Desiderius of Vienna murdered, when he (Columban) refused to bless the illegitimate sons of the king. She plotted with the Gallic bishops and eventually managed to have royal sanctions imposed on the monastery at Luxeuil. When this failed to deflect Columban from his Christian Faith, he was imprisoned in Besancon from where he escaped, to the chagrin of Brunhild. He was exiled to Ireland by royal decree and on the way to Nantes visited the grave of St Martin in Tours. The ship had barely taken to sea, when it was forced back by a storm. Thus it was that St Columban and his companions once more found themselves in Gaul. They travelled to Metz, where King Theudebert of Austrasia, the brother of Theoderic, received them most cordially. A number of monks from Luxeuil came to join Columban, who decided that Lake Constance would be a suitable site for missionary work in southern Germany, Helvetia (Switzerland) and Austria. The king made a rowing boat with a crew available to the aged missionary, who travelled down the Moselle and up the Rhine towards Lake Constance. Along the way the company came across traces of Irish Christianity, but most of the population were still pagan. Columban founded a monastery at Bregenz, but after only three years the upper Rhine came under the rule of Theoderic II and the scheming Brunhild. This forced the saint and his companions to journey up the Rhine and cross the Alps into Italy. His disciple Gall (Gallus) remained behind and founded the Irish monastery of St Gallen, and Sigisbert founded the monastery at Disentis near the source of the Rhine. Columban and his companions arrived at the court of King Agilulf of the Lombards in Milan in 613. Although an Arian, Agilulf received the Irish saint with much generosity. He gave Columban land in the Appenines for a monastery, in exchange for the monks praying daily for the prosperity of the realm. This monastery was duly established at Bobbio, where Columban would spend the remaining two years of his long earthly life. At all his settlements St Columban followed the Irish rather than Roman practices of calculating the date of Easter, insisting that the abbot has the ultimate authority over his monastery, instead of the local bishop. 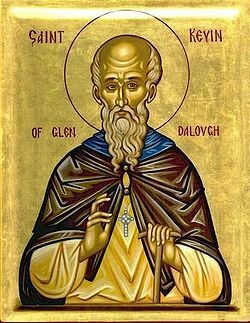 Furthermore, he introduced the Irish practice of private confession on the Continent, a custom that was favoured by St Basil the Great in the East. Apart from composing a monastic rule and penitentiary, that would later be adapted from a Benedictine viewpoint and wrongly attributed to the saint, he also wrote poems. His love for animals was such that he was able to charm squirrels out of the trees. He reposed on 23 November 615, the date celebrated afterwards as his feast day. Two years after his repose the monk Jonas of Bobbio wrote the saint’s biography. 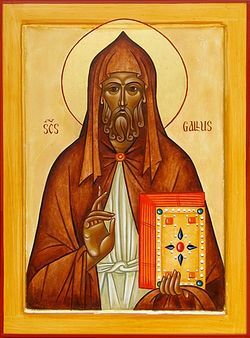 Like his mentor St Columban, St Gall was born in Leinster. He accompanied the famous Irish missionary through Belgium to Lake Zurich. He fell sick when they reached Arbon Forest, to the south of Lake Constance. When Columban continued on to Italy, Gall remained behind. Gall then became a hermit and travelling preacher, taking the Arbon Forest as his base. He outlived Columban by some 15 years and reposed around 630. After his repose a flourishing monastery arose on the site of his hermitage. It lasted until it was dissolved in 1805 by Napoleon. Feast day: 16 October. Another Irish missionary to the Continent was St Fursey, who was born in Galway of noble lineage. Already as a boy he read sacred books and observed monastic discipline. Around 630 he went to East Anglia, where he founded a monastery at Burgh Castle near Yarmouth. When the King of East Anglia was killed in battle, Fursey sailed to Gaul, where he established a monastery at Lagny on the River Marne. It was to become a spiritual centre of importance throughout Picardy. After his repose in 650, his relics were taken to Peronne, an Irish monastery that possessed early copies of St Patrick’s confessional and epistle. Feast day: 16 January. 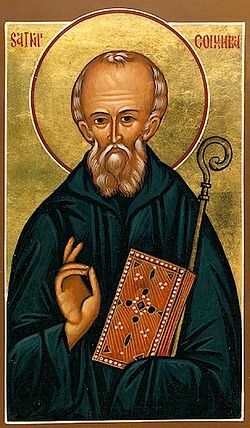 A monk from Iona, St Aidan, left the island with a group of companions in 635 and travelled to Northumbria to preach the Gospel to the English. He was invited by King Oswald, who had earlier been exiled from his kingdom and found refuge on Iona. Aidan established his monastery again on an island, this time on the rocky outcrops of Lindisfarne. From there he walked around the countryside and enjoyed close relations with the Northumbrian kings Oswin and Oswald, both of whom would be recognized as saints. Following the Irish tradition Aidan spent part of each year in solitude on the island of Inner Farne. He reposed on the last day of August, henceforth to be celebrated as his feast day, in 651 at the nearby royal castle at Bamburgh. On the same day a young boy herding sheep on a hillside had a vision of a current of light between heaven and earth, with angels descending in it to gather a beautiful soul upwards to heaven. The boy was Cuthbert, who later became Bishop of Lindisfarne and a beloved English saint. The Irish monastery on Iona would prove to be a bastion of Orthodoxy for the British and Irish people. 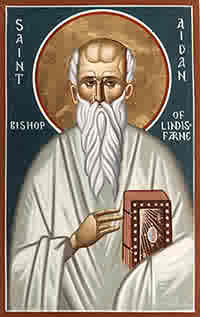 The Irish-born St Finan (feast day: 17 February) was sent from Iona to succeed St Aidan as abbot of Lindisfarne in 651. He followed the example of Aidan and worked closely with King Oswy of Northumbria, sending out missionaries to the English of Mercia and Essex. Among the monarchs baptized by him were King Penda and the English king Sigbert. When Finan reposed in 661 St Colman, another Irish monk from Iona, succeeded him as abbot of Lindisfarne. Colman was destined to become the main speaker for the Celtic Church at the Synod of Whitby in 664, during which Roman practices prevailed against the Irish. Thereupon Colman returned to Iona with 30 monks as well as the relics of St Aidan. From Iona they went to the far west of Ireland, where Colman founded a monastery on Inishbofin. Feast day: 18 February. In 679 St Adamnan became abbot of Lindisfarne at the age of 55. A few years later he went to Northumbria to negotiate the release of Irish captives, but while there he was converted by Coelfrid, the abbot of Wearmouth, to the Roman rule. When the monks at Iona refused to be budged from their Irish convictions he returned to Ireland. In later life Adamnan went back to Iona, where he reposed in 705. At the request of the Ionan monks he had earlier written the biography of St Columcille. He deserves further credit for campaigning against the pagan custom of sending women and children into battle, and he also insisted that clergy be exempted from military duty. Feast day: 23 September. Also during the 7th century St Kilian, an Irish monk from Mullagh, sailed with eleven companions up the River Main in Germany to Würzburg. There he founded a monastery, undertook missionary work in Thuringia and became the local bishop. He was martyred in 689 by King Gozbert after criticizing the monarch for marrying his brother’s widow. He thus followed in the footsteps of St John the Baptist, who was imprisoned and martyred for levelling the same criticism at King Herod. Feast day: 8 July. In the 8th century another Irish monk, St Fergal (Virgil), is reputed to have brought the relics of St Bridget to Salzburg, where he was ordained bishop in 744. A wonderful missionary, Fergal reposed in 784, the last major representative of Irish Orthodoxy on the Continent. Feast day: 27 November. As may be seen from these examples, monasticism played a crucial role in the Irish Church and everywhere it undertook missionary work. This was the case not only in the British Isles, but also in continental Europe, where the Irish monasteries were known as Schottenklostern (Scotia being Latin for ‘Irish’). It seems as if the Irish, more than any other Western Christian nation, realised the importance of withdrawal from the world in order to focus one’s entire life on the way towards God. Men and women by the thousands flocked to monasteries, there to devote their lives to attainment of virtue, prayerful contemplation, and union with God. In the monastic life external distractions from the spiritual struggle can be reduced, in order to concentrate on the inner warfare against the passions. As in Orthodox monasticism, the Irish monks and nuns combined the inner life of contemplation (vita contemplativa) with the daily life of working and preaching (vita activa). This is in accordance with the example set by Christ, who according to the Gospel regularly withdrew to mountains for solitary prayer, after which He descended to proclaim the Kingdom, heal the sick, cast out demons, and break the power of evil. In the Homilies of Cambra, dating from the 8th century, three levels of martyrdom were held forth for Irish monks. The first level is white martyrdom, which entails cleansing the body through privation, fasting and voluntary suffering. The second level is green martyrdom, in which purification is carried into the soul by means of renunciation of all desire and repentance of past sins. The final level is red martyrdom, in which the monk becomes a missionary going into the world, ready to suffer persecution and death for the Kingdom of Christ. Apart from the numerous monasteries on the Irish mainland, smaller ones were established on some of the islands off the west coast of Ireland. The most famous of these was Skellig Michael (Michael’s Rock), named after the Archangel Michael. It rises steeply like a pyramid out of the sea and is only accessible by boat on certain summer days, making it ideal for a life of asceticism and contemplation. Skellig Michael was plundered by the Vikings early in the 9th century, after which it fell into disuse. During the early Middle Ages the Irish monasteries became famous for their high level of learning. They imported books from major Christian centres such as Alexandria and Antioch, thereby maintaining the spiritual links with the rest of the Orthodox Church already referred to. Furthermore, the Irish monasteries created their own books in writing rooms called scriptoria. Among the most influential monastic schools were those at Inishmore (founded by St Enda), Bangor (founded by St Comgall), Clonard (founded by St Finian) and Clonmacnoise (founded by St Ciaran). Greek, Latin and Hebrew were taught at these centres. Some evidence has survived of the impressive geographical and astronomical knowledge of the Irish monks. Early in the 9th century Dicuil of Clonmacnoise wrote a book on the measurement of the earth, in which he mentions the midnight sun in the north and describes the Nile. Furthermore, Dungal of Bangor was invited to teach in Pavia in 825 because of his great knowledge. He had written a letter to Charlemagne in 810 in which he explained a double eclipse of the sun in that year by means of what we now call 'Copernican' ideas. It took 50 years after the ruling at Whitby for the monks of Iona to accept the Roman date for the calculation of Easter. In 802 Iona was attacked and plundered by Vikings, and five years later monks fleeing the island founded the monastery of Kells in County Meath. There they completed the most famous Irish literary product of the Middle Ages, the Book of Kells. It was illuminated with brilliant decorations at Iona only a year or two before their flight. In it the four Evangelists are portrayed by their traditional symbols: St Matthew by a man, St Mark by a lion, St John by an eagle, and St Luke by a calf. Their Orthodox feast days correspond precisely with the Irish seasons: St Matthew (16 November) is commemorated during Samhain, St Mark (25 April) in Imbolc, St John (8 May) in Beltaine, and St Luke (18 October) in Lammas. This is another connection between the Irish spirit and the rest of Orthodox Christianity. Mention also has to be made of the Irish contribution to Christian theology, over and above the educational work done in Irish monasteries. Irish theology displayed an emphasis on Scripture that was unusual for Western Europe, besides being of an ascetic and mystical nature. In agreement with Orthodox theology, creation was believed to take place out of nothing (ex nihilo) through Christ. The created world was viewed as a theophany, a self-manifestation of God. Because of the Fall of man, the whole created world had fallen away from God; through the Incarnation of the Word creation may be restored to its original state of immortality. From this it can be seen that Irish theology was theocentric and holistic, in contrast to later heterodox Christianity with its humanist and dualist tendencies. During the 9th century a group of Irish monks worked at the Frankish courts of Charlemagne and his successors. The most famous of these wandering Irish was John Scottus Eriugena, who left Ireland in the early 840’s for the palace school of King Charles II (Eriugena means ‘Irish-born’ – it is applied to John to distinguish him from the medieval John Duns Scottus). The king was an admirer of all things Greek, in sharp contrast to his grandfather, Charlemagne, who tried to rid the Western Church of Greek influences. At the royal court Eriugena translated important Greek Christian texts, including the complete works of St Dionysius the Areopagite, into Latin. In this way he helped transmit some of the theology of the Christian East to the Christian West. In addition to his teaching and translating activities, Eriugena wrote a number of major theological and philosophical works. It included a treatise on eschatology (i.e. the discourse on the last things) called On Divine Predestination, which was written on the request of the local archbishop to refute the teachings of the monk Gottschalk, who had taken certain teachings of Blessed Augustine to extreme conclusions. This included a doctrine of double predestination, according to which God elects some people for salvation and others for damnation. In his refutation Eriugena argued that God, being good, does not predestine anyone to damnation and did not create evil or hell. God’s foreknowledge of all things should not be confused with predestination. Salvation may be obtained through the interaction of human free will and divine grace, not just one of the two. This view was in agreement with the Orthodox insistence on the interdependence of (created) nature and (uncreated) grace, something the Irish Church gave its whole-hearted acceptance to. However, later medieval heterodoxy chose Augustinianism and accused Eriugena of ‘Pelagianism’, with Calvin and his followers later popularizing the doctrine of double predestination in the Protestant world. Furthermore, in a massive work called Periphyseon (‘About nature’) Eriugena presented a unified view of the whole of reality in a profoundly mystical vein: God, the creation of the world and man, and the return to God. Everything in the universe is said to participate in a double movement: a procession or going out from God and a return to God. A continuous movement is thus taking place between the Uncreated (God) and the created (the angels, man and the world). From the early 13th century onwards the Middle Ages suppressed Eriugena, with his work being condemned and placed on the Index of banned books. Only during the 20th century has his greatness begun to be recognized, a process in which contemporary Irish scholars such as John O’Meara, Mary Brennan, Dermot Moran and Deirdre Carabine have played no small part. Today Eriugena is widely regarded as the greatest Western philosopher of the early Middle Ages, the most important link between East and West in medieval Christianity. During the final years of the second Christian millennium and the first years of the third, the fullness of the Orthodox Christian faith was brought to Ireland with the establishment of Greek, Russian, Romanian and Georgian Orthodox churches in Dublin. In addition, an Antiochian church was founded in Belfast, amidst an Ulster population torn apart by decades of sectarian conflict. Thus has the vibrant spirituality of Irish Christianity developed via its flowering in monasticism and missionary activity, its suffering at the hands of the Viking invasions, its oppression from the time of the Anglo-Norman invasion onwards, and ultimately its fulfilment in the Orthodox Christian Faith. Glory to Thee, O God, Glory to Thee! It is generally believed that St Patrick brought the Christian Faith to Ireland, his traditional title being Apostle of the Irish. 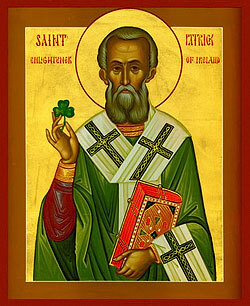 Without wishing to diminish St Patrick’s importance in any way, it is relevant to point out that in 431 St Palladius was sent to Ireland by St Celestine I Pope of Rome, as the first bishop of the Emerald Isle, with the task of administering the sacraments ‘to the Irish who professed Christ’. Hello Kim, it seems I erred when mentioning 'Irish bishops' in connection with St Hilary of Poitiers. His book 'De Synodis' was dedicated to the Western bishops, including those of the 'provinces of Britain'. However, it is safe to assume that the latter included the Irish Christians at the time, as the difference between P and Q Celtic was still small and the Irish Sea formed no barrier between the British and the Irish. It would therefore be natural to have bishops presiding on both sides, just as a century later there were kings ruling on both sides, like the Dalriada in the north and the Eoghanacht of Munster ruling in parts of Wales. The king of Munster around 360, Conal, was already a Christian, thus predating the arrival of Saints Palladius and Patrick by several decades. My apology for the typing error. (With acknowledgement to my Irish Orthodox friend Conor MacCarthy). Thank you Cyril, the article has meanwhile been published in booklet form by the author, in English and Russian. My email is wdebeer@yahoo.com. I would like to obtain more information about one of the sources this writer (Vladimir de Beer) references. He mentions a writing of Hilary of Poitiers that refers to "The Irish Bishops". 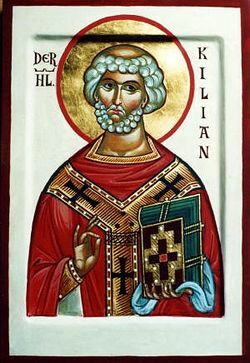 I would like to know what book of St. Hilary's that is in. I am desperately trying to find it! Thank you. 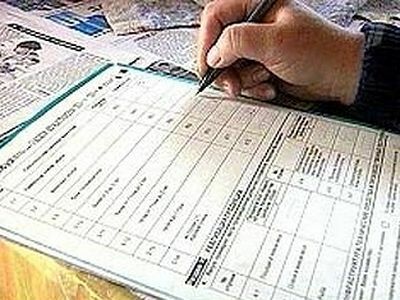 An excellent article and most interesting. Please tell me who are the publishers.